← Royalty – Your Choice…. The weekend has been busy for me again. The wife is so busy I can hardly get on my PC, so I have resulted in using my Galaxy Note 10.1 tab, bluetooth keyboard and a shared internet connection. Everything takes that bit longer unfortunately, but at least I can still work on my blog only at a lower pace. Anyway, as I hadn’t seen Adam for a few weeks I made my monthly pilgrimage to Mustang Maniac, the excuse I made was, “at least I will be out of your way!” With that the “Day Pass” was issued, gratefully accepted by yours truly and I was off. Once I arrived I was speaking to the guys who were showing me the new improvements that were going on to cope with the demands for their work. I believe a blog will be coming out about it soon. After a good few hours of chatting, meeting people coming into the office and watching a few last-minute repairs on a customers car by fitting of some nice LED bulbs to the side lights on a ’66 coupe. I had a wander round the stock rooms. I spotted some rear shocks that had just arrived so nabbed a pair of them pretty sharpish and immediately decided what was going to be my new project for Sunday. My current shocks were a gas adjustable pair, the only problem is, there is no plumbing for the right hand side and the left hand side is seized solid. I knew these had to be changed regardless, and as the wife was still working, I took tools along with my new shock absorbers out the garage to get some work done. I have written a full process for changing the shocks under Photos Menu – Rear Shock Replacement or click here for the quick link. To cut a long story short, if you pardon the pun, I ended up having to cut one side of the old shock stem off with a hacksaw, in order for me to get it out of the bracket. Not exactly proper mechanics, but as I wasn’t going to keep the old shocks it didn’t really matter. The trouble is it just doesn’t look good with a pair of legs hanging out the front of a garage with that distinctive sound of a hacksaw on metal. The new shocks were a performance rated pair, and according to Adam they are a lot of shock for not a lot of money. On top of that they looked quite good too being all in white. The only thing I could say was that I was worried yet again by the fact that the previous efforts of the “Herbert” to restore this car were a bit of bodge job to say the least. Spanner points rounded off, nuts loose on top of the shocks and at the bottom, old parts just left in the recesses etc. What else am I going to find? Plenty I expect, but don’t worry, I will let you know when I do find something else! Photo Menu – Rear Shock Replacement click here. 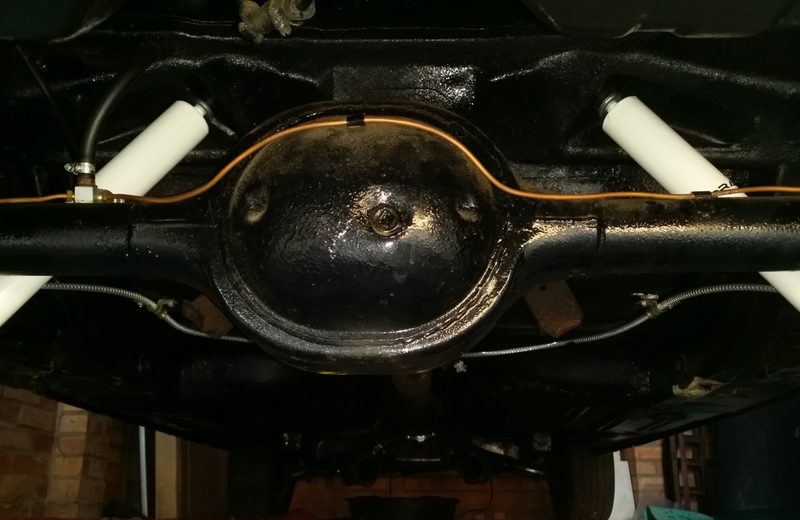 This entry was posted in Blog, Car, General, Photo's and tagged garage, gas filled, guide, hacksaw, Mustang, photos, replacement shocks 66 Mustang, shock absorber. Bookmark the permalink. Well done. Bits and pieces, as always proud of you one job at a time. PS Mustang maniac posted a delightful picture of a 66 today! Thanks for the mention Debbie.